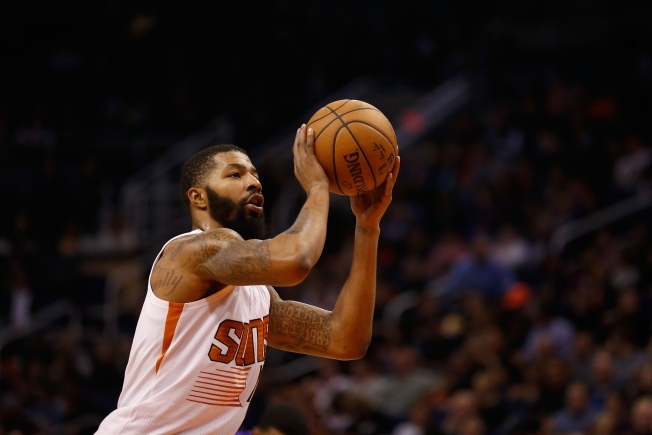 A week after scuffling with a teammate, Phoenix Suns forward Markieff Morris was traded Thursday to the Washington Wizards, which are hoping to boost their chances of making the playoffs. Phoenix received first-round draft pick – protected to the ninth spot – and forwards Kris Humphries and DeJuan Blair in exchange for Morris, who stands 6-foot-10 and weighs 245 pounds. The 26-year-old offers frontcourt versatility and athleticism for the Wizards, who entered their first game after the All-Star break. The move ends Morris’ tumultuous tenure in Phoenix. In December, Morris was suspended for two games after he threw a towel at former coach Jeff Hornacek during a game. He also got into a physical confrontation last week with Archie Goodwin during a first-quarter timeout during a game with the Golden State Warriors. Wizards general manager Ernie Grunfeld said he didn't think Morris' issues with the Suns would cause trouble in a new locker room. "We needed someone who will play with a little bit of a chip on his shoulder and has something to prove," Grunfeld said. "And I think after speaking to him this afternoon, he's that type of player." Morris never seemed to get over being upset about the Suns trading twin brother Marcus to the Detroit Pistons in the offseason, making clear that he wanted to leave Phoenix, too. The Morris brothers still face two felony aggravated assault counts in a 2015 case connected to a fight outside a Phoenix health club. Morris is now in his fifth NBA season, all of them with Phoenix. He was third on the Suns in scoring, at 11.6 points, averaging 5.2 rebounds and 2.4 assists per game. Last season was his best in the league, as he averaged 15.3 points and 6.2 rebounds per game. However, he also tied with Oklahoma City Thunder guard Russell Westbrook for the most technical fouls in the NBA at 15. Morris’ contract is worth $8 million per year.